Himalayan Pilgrimage Journey Pvt. Ltd.
Paragliding and other adventerous sports. Scenic Drive with eye catching views. Kathmandu Pokhara tour the best packaged tour into two of the touristic hub of Nepal. Kathmandu valley (1360m) is the capital city of Nepal and also the home of fascinating architectural and historic sites which has also been listed into World heritage sites. Some of the most popular heritage sites are Pashupatinath (the holy temple of lord Shiva), Swoyamanbhunath (the Buddhist symbol of Nepal), Patan Durbar Square (ancient 13th century temple of Lord Krishna), Basantapur Durbar Square and Bhaktapur Durbar Square. These fascinating old and historic sites are the best sightseeing around Kathmandu valley. Apart from visiting historic palace and ancient sites Kathmandu valley is also famous for its delight natural sightseeing places around such as Nagarkot, Sundarijal and so on. Pokhara (827m) is the paradise city of Nepal. This fascinating valley situated at the western region of Nepal at the lap of Mt Annapurna is the best natural and cultural sightseeing city of Nepal. Flourished with majestic Himalayas view, crystalline Lake and a shiny city, this delighted city offer a wide range of touristic spot and attracts tourist because of the adventurous sport that commence in Pokhara. Kathmandu Pokhara Tour starts with a natural and cultural sightseeing tour at Kathmandu valley and then we drive for 5-6hours all the way to Pokhara. After exploring Kathmandu valley we come to visit one of the most popular city of Nepal. Pokhara is a lively place where one can enjoy the cultural sightseeing at various historic palaces and shrines, natural sightseeing at various sightseeing spot where you can enjoy the best natural sight of panoramic Himalayas view. Commence this fascinating tour and enjoy the quality time spend in Nepal. Accommodation at star rated Hotel. Both Transportation and air fare. Private Vehicle throughout the Tour. All beverage and others personal expenses. Hot shower during the tour. Day 1: Welcome to Kathmandu Valley (1360m). Upon your arrival we assist you from Kathmandu international airport to our hotel. Enjoy cultural programs at hotel along with delicious dinner. Overnight at Hotel. Day 2: Full day Kathmandu Valley sightseeing tour and overnight at Nagarkot. Today after breakfast we go to Basantapur Durbar Square. One of the Heritage Site of Nepal and also the most popular touristic area. Enjoy the ancient cultural temples and historic palaces. After lunch we drive for 15min all the way to Pashupatinath temple (the most Holi temple of Lord Shiva), Symanbhunath (the symbolic Buddha stupa). After Kathmandu sightseeing we drive for 1-2hours into a scenic route all the way to Nagarkot (2100m). This fascinating Hill station is famous for its cultural village and astonishing sunrise view along with fascinating Himalaya range view. Overnight at hotel. Day 3: Early morning sunrise view and then drive to Bhaktapur. Overnight at Kathmandu. Today early morning after breakfast we hike for an hour all the way to the famous Nagarkot View Tower. Sightsee some of the best natural scenery and then drive to Bhaktapur. Explore the famous Heritage site of Bhaktapur. Bhaktapur is a beautiful cultural city flourished with ancient temples, historic palaces and fascinating cultural and religious shrines along with. After Lunch visit Famous Bhaktapur Durbar Square and 55windowed temple of Bhaktapur. Evening drive for an hour to Kathmandu. Overnight at hotel. Day 4: Early morning scenic drive to Pokhara (900m). Today we drive an early morning ride from Kathmandu all the way to Pokhara. The city of Lake, Paradise city of Nepal. Pokhara situated at western region of Nepal is one of the must visit place of Nepal. Pokhara is a city blessed with cultural temples and shrines along with most beautiful and exotic natural scenery. We visit famous Mountain Meusium, Pagoda Temple and famous Phewa Lake. Overnight at Hotel. Day 5: Full day Pokhara Valley sightseeing. Today early morning scenic drive for 45min all the way to Sarangkot. Sarangkot (1600m) is the best Himalaya sightseeing spot of Pokhara. Sarangkot is also famous for its adventure sport. 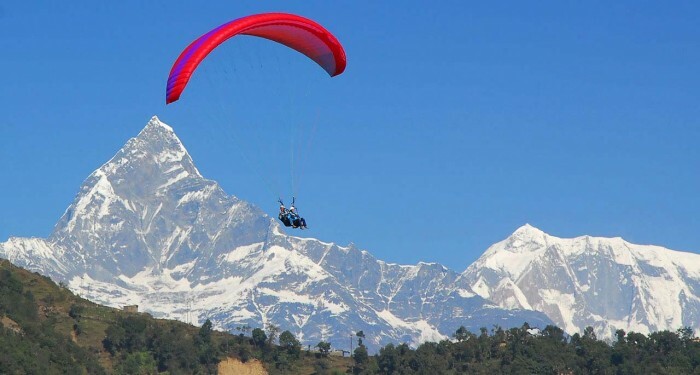 You can commence Paragliding, fly above Pokhara and visualize some of the most exotic views of Nature. After Lunch drive back to Pokhara and then visit some of the famous temple and shrines around. Evening at Lake Street. Overnight at Hotel. After breakfast we fly a scenic 30min flight from Pokhara to Kathmandu. You may further tour Nepal with us or depart. “As an explorer and a photographer, I really had a great time in the country. Feels good, but unpleasant someway to leave with nothing but memories and photographs. It was fun where Himalayan Pilgrimage Journeytook me to.